The 9th IPF 2014 press conference has held on Tuesday, 18 February 2014 at BPGMEA office and speech delivered by Mr. Md. Jashim Uddin, President, BPGMEA. 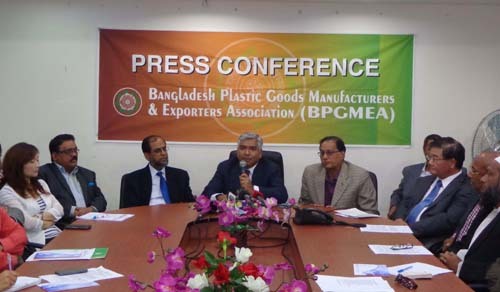 Bangladesh Plastic Goods Manufacturers and Exporters Association (BPGMEA) and Chan Chao Int’l Co. Ltd. Jointly organizing the 9th International Plastic Fair 2014 (IPF 2014) in Dhaka, Bangladesh. The 9th Bangladesh International Plastics Packaging Printing Industry Exhibition (IPF 2014) will be held on 20-23 February 2014 at Bangabandhu International Conference Center, Sher-e-Bangka nagar, Dhaka, Bangladesh. Mr. Abul Maal Abdul Muhith M.P, Hon’ble Minister, Ministry of Finance, Government of the People’s Republic of Bangladesh will inaugurate on Thursday, 20 February 2014, 12.00pm. Machinery, Mould, Raw Material manufacturer and supplier with different type local user base of Plastic goods manufacture company will be join in this IPF 2014 exhibition. 300 stalls with 15category exhibitor will be attended in exhibition. Mention local base categories are Plastic House Hold items, Packaging Materials, Plastic Mould, Toys items, Pharmaceuticals items, Plastic Furniture, Melamine items, Garments Accessories items, PP Woven Bag etc. On the other hand foreign base plastic goods manufacture machine and catalogues are Plastic Injection Molding machine, PP Woven Bag Machine, Packaging Machine, Flexography Printing Machine, PET Blow machine, Plastic Bag Making Machine etc. Also Seminar, Symposium, Cultural program and buyer-Seller meeting will be arranged in this fair. Hope Economist, Scientist, Engineer, Journalist and all segment visitors will attend in this fair. Next: The 9th International Plastic Fair 2014 Opening Ceremony, Date: 20 February 2014.